Nancy, Bens wife has been working with Ben since 1989. Nancy holds a Bachelor of Education and has years of teaching experience in the public and private school systems. 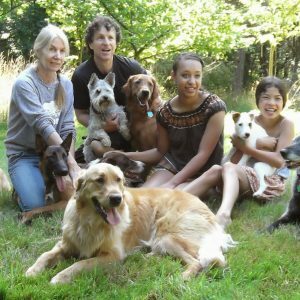 Dog training, professional dog trainers program, pet hotel, doggie daycare –Nancy excels at all aspects of the Wonderdogs services. Corrina has been instrumental in the success of our pet hotel and daycare. Clients give her rave reviews for her attention to detail, incredible work ethic, love for our fur guests and great smile that will add cheer to any situation. She has natural dog intuition from growing up with animals and strong leadership qualities essential to being in charge of our puppy pack. Our daughters Chloe and Jaling have been helping with our family business for years. They both have a love for all critters including their 16 chickens and 3 sheep. Grooming, exercise, feeding, cleaning, dealing with clients, pick up service—they do it all! Both are in the music program at the University of Victoria so our guests are well entertained daily.